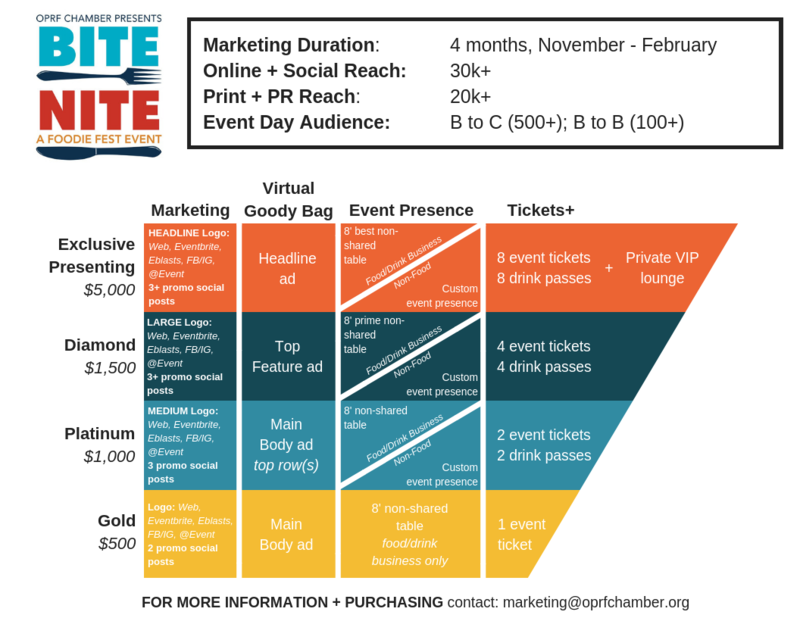 Vendor + Marketer REGISTRATION - Bite Nite 2019 - Jan 25, 2019 - Oak Park-River Forest Chamber of Commerce, IL ? Registration is closed. Vendor spots are full. Contact Events Manager, Janice Moskoff, to join vendor waitlist to open 2nd vendor room. Verbal confirmation with a volunteer does not gaurantee a spot. Registration open for virtual goody bag ads only. 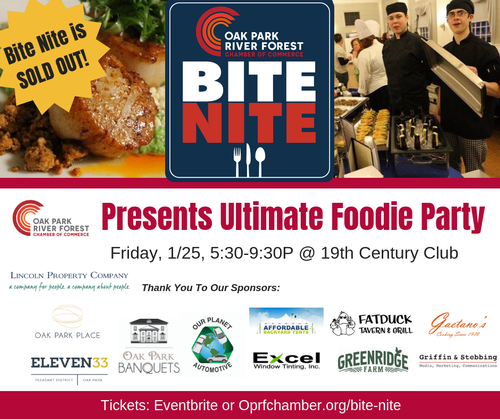 5th Annual Bite Nite on FRIDAY, JANUARY 25, 5:30-9:30pm @ The Nineteenth Century Club in Oak Park, is a celebration of outstanding local dining. This annual mid-winter event attracts 500+ attendees sampling small bites from 50+ local restaurants, caterers and food brands during an evening of music + drinks and always SELLS OUT. Vendor Benefits It's FREE, exclusively for food/drink businesses only. OPRF Chamber does NOT charge to participate. It's EXCELLENT MARKETING. Chefs, owners + managers come face-to-face with hundreds of enthusiastic foodies. We market event to an audience of 30k+ online, and via e-blasts, PR, social media, + print advertising. Vendor FAQs HERE. EVENT IS FREE to participate. Spaces are limited to food/drink vendors and will fill. Late vendors will be waitlisted. Vendors can self-market. Share menus, coupons, handouts, etc. Dress-up table creatively to brand. VIRTUAL GOODY BAG OPRF Chamber will email a virtual goody bag filled with offers to 600+ post-Bite Nite. Ads start at $25. View sample goody bag HERE. BUY YOUR OWN 8' TABLE (SOLD OUT) Don't want to share a table? Buy out your table partner for $300. Interested in being a vendor or sponsor in 2020, contact us. Parking - Park in garage just south of The Nineteenth Century Club on Forest Avenue (Lake & Forest Parking Garage, entrance on Forest).